Snap peas are one of my favorite things about gardening in the cooler seasons of the year. My daughter will eat them raw as I pick them. I like them blanched and as a carrier for various sorts of dips or in green salads as a sweetly substantial crunch with my greens. I devised this recipe back in June when we had a bumper crop. 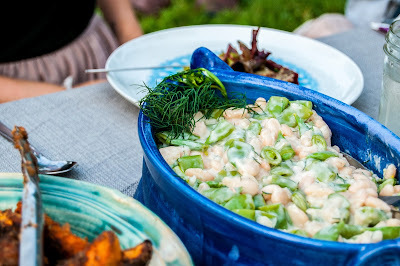 It was served at the Dinner in the Garden / For Reals Meals event to great acclaim by the attendees. Now that the weather is cooling again snap peas will be in season and you can prepare this for any upcoming gatherings of your own. The snap peas used for the dinner event were all from the Blissoma community garden. There were a LOT this spring so I was scheming constantly on ways to put them all to good use. The Yogurt Miso Sauce could be made with soy yogurt but I had the worst time finding any even in health food stores in St. Louis. Consequently I used an organic, humane goat milk yogurt instead. It seems all the soy yogurt around me was replaced by just coconut yogurt, which was sweet (I tried it just in case) and totally unsuitable for this recipe. It was one of the only recipes for the entire dinner that ended up not vegan. Fortunately many people digest goat milk better than cow milk, and it is generally not factory farmed which eliminates many of the environmental and gustatory concerns related to dairy. I wanted a really savory, tangy sauce and this particular mixture turned out to be insanely delicious on crackers and just as a dip for other veggies too. The miso and white truffle oil add layers of flavor that bloom in the mouth as each bite goes down. I'm getting hungry just thinking about it. Make sure you buy an organic miso paste or read labels very carefully as otherwise you're likely to end up with unwanted MSG, which is common in many mass produced misos, or since it is a soy product anything non organic is likely GMO. Even most of the miso pastes at my local asian market are packed with MSG. I had to get the cleaner version from an independent, locally focused grocery store. The miso paste is usually salty and provided all the salt this sauce needed. If you find yours needs a little more you could add a splash of soy sauce or a sprinkle of sea salt. Mix all ingredients and allow to sit for several hours in the refrigerator to blend the flavors. Soak and cook cannellini beans according to package directions (beans are generally an 8 hour overnight soak, rinsed, and then boiled until soft). Drain and set aside. 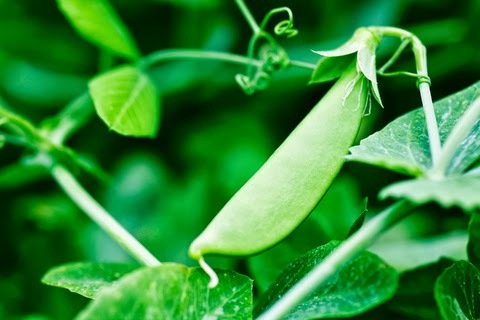 Blanch snap peas by placing in boiling water for 1 minute, then quickly drain and rinse in cool water to stop cooking. Allow to cool. Cut each snap pea in two sections and remove any tough tips from either end. Mix beans, snap peas, and yogurt miso sauce. Serve chilled. If you don't mind dairy then the addition of a little blue cheese or feta was an amazing added flavor. I ate many of my leftovers topped with it as a treat. The tangy and pungent flavors of both these cheeses was delightful. Feta was a little more overpowering, oddly enough. The blue blended in more seamlessly and had a creamier texture with each bite. Depending on the effect you want either could work. I know my cohost Jess is going to be excited to finally see this recipe posted and hopefully you'll find it to be a palate pleasing delight as well. It's a dish that can help you easily enjoy seasonal eating. More peas, please!